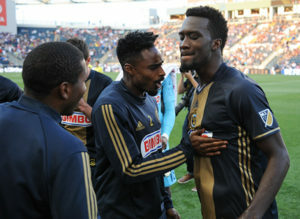 There were a lot of things Philadelphia Union forward C.J. Sapong hadn’t done before 2017. He hadn’t scored double digit goals in a season. Twice, Sapong reached nine goals, first in 2012 with Sporting Kansas City and again in 2015 with the Union, but that 10th goal eluded the 6’1″ and 185lb striker. In 2017, Sapong not only got his 10th, but also his 11th, 12th, 13th, 14th, 15th, and 16th goals of the season. Those 16 goals shattered his previous personal best and broke the Union’s franchise record for goals scored in a season. Sebastian Le Toux previously held the record with the 14 goals he scored in 2010. He had never scored a hat trick. Maybe it’s trivial, but what player doesn’t want to brag about bagging three in a game? On May 6, Sapong knocked in his first trifecta in a 3-0 win over New York Red Bulls. If that date sticks out to you, it might be because it was the game that ended Philadelphia’s ignominious 15-game winless streak. With those three goals, Sapong hoisted the team (and really the entire fanbase) on his back to secure the Union’s first victory in 251 days. Even when achieving his most individualistic accomplishment, Sapong did so when his team needed it the most. It was unselfishly selfish– and unselfish might be the best word to describe the Manassas, Va. native. He had never started a match for the United States Men’s National Team. Sure, Sapong was capped twice making some late substitution appearances during friendlies back in January of 2012, but that was a lifetime ago. Yes, Sapong briefly flirted with a national team call-up in 2016, but an 11 game scoreless streak to end the season seemed to reaffirm he didn’t have the talent to wear the Stars and Stripes. 16 goals and five assists can change things– so can an embarrassing failure to qualify for the World Cup. So when the U.S. national team traveled to Portugal for a friendly in November, it was easy to understand why there were some fresh faces in the starting 11. When the opening whistle blew, it was Sapong standing at the front of the U.S. attack. The striker capped off his tremendous year with a solid performance at the Estádio Dr. Magalhães Pessoa in Leiria, Portugal. Hmm, are we sure this isn’t a quote from Union head coach Jim Curtin? The thinking is Sapong is just a guy for friendlies and meaningless matches at the international level. Even if he sticks around for a bit, it’s tough to envision the 28-year-old striker being a serious candidate for a trip to Qatar in 2022. But as the national team transitions toward youth, maybe they need a player like Sapong. The talented teenagers could learn something from a hard-working forward who didn’t get his first national team start until he was 28. After everything mentioned above, it’s easy to say 2017 was the best season of Sapong’s career. And I would have called you a liar if said this would happen back in January. After a combined 49 starts in 2015 and 2016 that produced only 16 goals, the Philadelphia front office realized they needed to bolster the attack. Sapong seemed to be an adequate MLS player and nothing more. He could be a late game sub and capable spot starter, but he wasn’t the player that could lead from the front all season. The Union’s sporting director, Earnie Stewart, signed striker Jay Simpson from English League Two side Leyton Orient. It looked like Stewart had found the man to be the “1” in the Union’s 4-2-3-1 formation. While Simpson’s former club affiliation didn’t stand out, the London native did progress through the Arsenal youth system and made sporadic cup appearances for the gunners. Still, the biggest indication of Philadelphia’s commitment to Simpson was his guaranteed compensation of $508,333.33— or $208,333.33 more than Sapong. Yet after an early season injury to Simpson, Sapong was forced back into the starting lineup. He would make sure he wouldn’t lose that spot, playing great soccer and scoring goals. Sapong’s problem has always been consistency. For every month of dominance, there was one of ineptitude. This year, Sapong’s performance did not dip as the season wore on. There is plenty of reason to think his form was unsustainable. Maybe Sapong is closer to the player of his first six years in the league than the player he was in his seventh season. Maybe the Union should still search for the star striker this January. But this isn’t about what may come in 2018 or 2019. It’s about what happened in 2017. Sapong was the best player on the Union, and thus the best player in the area. C.J. Sapong is PSP’s Men’s Player of the Year. You have to give credit to CJ for having a career year — breaking his personal goal scoring record, the club’s season record and putting in a quality shift for the national team, even if it was just a friendly. He was really the only bright spot for an otherwise dim season. Totally agree. Blake had another incredible season, but CJ earned it this year. I feel like I was the only one defending him last year. I still contend that he would have had his breakout year last year if Jim had just left him at forward for the full game.